We are on the brink of a golden age in the field of energy. There is a far greater mass of first-class science and engineering being applied to energy now than ever before in the United States and elsewhere. Game-changing energy innovations that help our national security, economic well-being, and an improved environment are the engine for a bright future. But while the possibilities for dramatic new game changers are endless, we are not exploiting those opportunities. We in the United States have been on an unfortunate roller coaster for the last fifty years: a crisis motivates research efforts, which then recede when that crisis ends. We need to rev up the engine of energy innovation in our country, and this time, we cannot allow that engine to stall. The Stanford-MIT Energy R&D Game Changers project is a joint undertaking of the MIT Energy Initiative (MITEI) and the Hoover Institution at Stanford University. By highlighting the historic and current effects of research and development efforts from US universities, we aim to show the importance of sustained support for basic energy research and development if the United States is to meet its goal of a cheaper, cleaner, and more secure national energy system. 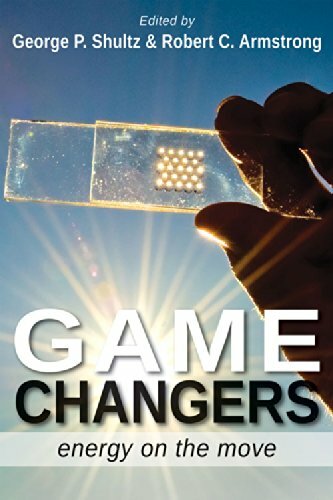 Please contact us to join with other leading US energy research centers and become a contributor to Game Changers. George P Shultz is the Thomas W and Susan B Ford Distinguished Fellow at the Hoover Institution. He is one of two individuals who have held four different cabinet posts; has taught at three of this country’s great universities; and for eight years was president of a major engineering and construction company. Shultz was sworn in on July 16, 1982, as the sixtieth US secretary of state and served until January 20, 1989. He is advisory council chair of the Precourt Institute for Energy at Stanford University, chair of the MIT Energy Initiative External Advisory Board, and chair of the Hoover Institution’s Shultz-Stephenson Task Force on Energy Policy. Robert C Armstrong is director of MITEI. He was cochair of the Energy Research Council that laid the groundwork for MITEI and served as deputy director for the initiative’s initial six years, during which time it funded more than eight hundred research projects. Armstrong is the Chevron Professor of Chemical Engineering and has been a member of the MIT faculty since 1973. He headed the Department of Chemical Engineering from 1996 to 2007. His research interests include polymer fluid mechanics, rheology of complex materials, and energy. In 2008, Armstrong was elected into the National Academy of Engineering for conducting outstanding research on non-Newtonian fluid mechanics, coauthoring landmark textbooks, and providing leadership in chemical engineering education. Jeremy Carl is a research fellow at the Hoover Institution and director of research for the Shultz-Stephenson Task Force on Energy Policy. His work focuses on energy and environmental policy, with an emphasis on energy security and global fossil fuel markets. Before coming to Hoover, Carl was a research fellow at the Program on Energy and Sustainable Development at Stanford and a visiting fellow in resource and development economics at the Energy and Resources Institute in New Delhi, India. His writing and expertise have been featured in the New York Times, Wall Street Journal, Newsweek, and many other publications. He holds degrees in history and public policy from Yale and Harvard Universities. Louis Carranza is associate director of MITEI, which he joined in 2013. He was previously vice president for strategic development at IHS, where he worked for seventeen years. At IHS, he served as executive director and cochair of CERAWeek—one of the top five corporate leader conferences in the world—and conceived of and implemented the CERAWeek partnership pro- gram. He was also codirector of the IHS scenario planning initiative. Before joining IHS, Carranza managed Cambridge Energy Research Associates’ global power practice. Rebecca Marshall-Howarth is MITEI’s editorial services and publications director. After two decades in the computer industry, focusing on process control and the oil, gas, and power markets, she joined MITEI in 2009. She provides editorial assistance to both staff and faculty authors of MITEI publications. She also oversees the design and production of MITEI publications, in addition to serving as custodian of the MITEI brand. She was the key contact for copyediting, design, and production of Game Changers: Energy on the Move. Francis O’Sullivan is MITEI’s director of research and analysis and a lecturer at the MIT Sloan School of Management. He has been at MITEI since its early days, most recently serving as the executive director of the Energy Sustainability Challenge. His current research focuses on solar, unconventional oil and gas resources, and the energy-water nexus. O’Sullivan is a member of the National Academies’ Roundtable on Science and Technology for Sustainability. Previously, he was a consultant at McKinsey & Company in the areas of economic, investment, and risk analysis; strategic planning; and operations in the private equity, oil and gas, electric utility, and renewable energy sectors. Commander David Slayton is a research fellow at the Hoover Institution, a member of the Task Force on Energy Policy, and co-chair of the Arctic Security Initiative. He was a national security affairs fellow from 2010 to 2011 and a visiting fellow from 2011 to 2012, during which time he was engaged with congressional legislative efforts and national security policy development in Washington, DC. During his Navy career, Slayton completed twelve combat deployments, to include commanding the largest US Navy combat unit in Afghanistan in 2009. A career naval flight officer, he has flown more than three hundred combat missions and participated in a broad range of combat operations on the ground, at sea, and in the air. His research, writing, and contributions focus on national security, energy, the Arctic, and Asia-Pacific maritime strategy.